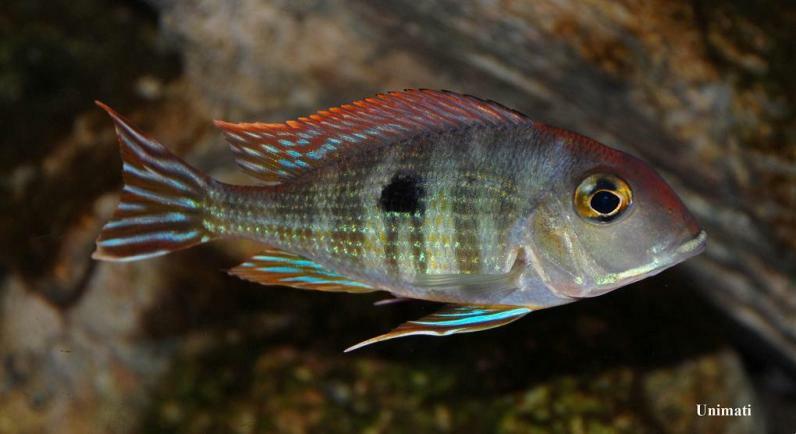 This undescribed species is among the most colourful in the genus. 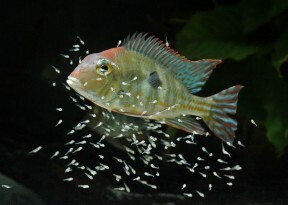 Image shows rio Arapiuns form. Like others in the G. surinamensis species group G. sp. 'orange head' fares best in a group. Here the Arapiuns form. 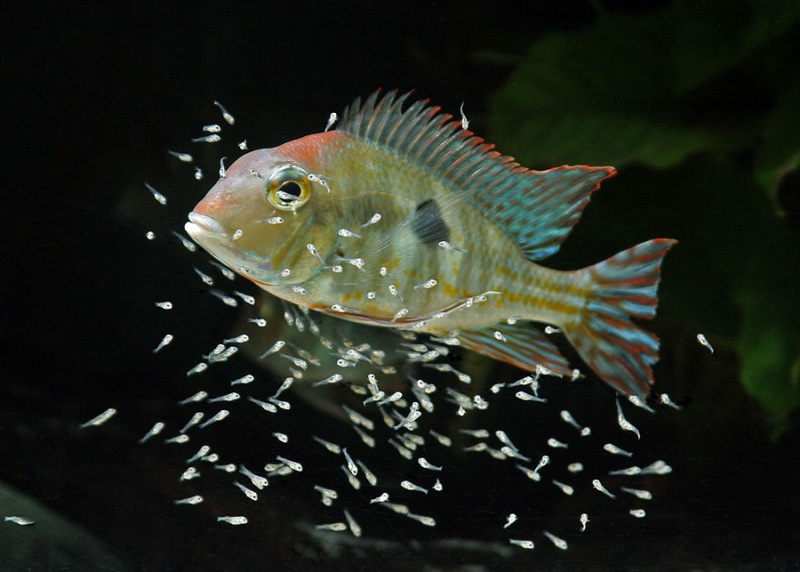 ...the male moves in to fertilise them. 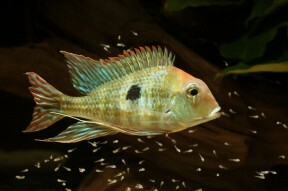 Female of Arapiuns form with free-swimming fry. 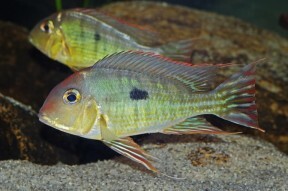 Female of Arapiuns form with fry. 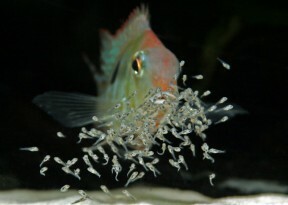 Female of Aarapiuns form with just-released fry. Pair of Arapiuns form with fry, female front. A group of young specimens. Slightly older juvenile exhibiting some pattern development. 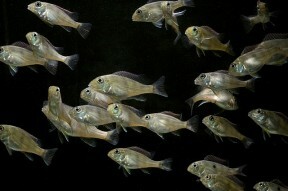 As the young fish grow older still they begin to develop adult patterning. First collected in 1991 by German aquarists Christop Seidel and Rainer Harnoss (Steinhaus, 2010) from the rio Tapajós, eastern Brazil. A second form which differs slightly in head colour and morphology later appeared in the trade as G. sp. ‘orange head Araguaia’, referring to the major tributary of the rio Tocantins. The rio Xingú lies between the Tapajós and Tocantins so this led to speculation that there should exist an ‘orange head’ form in that drainage, too. However it’s now known for certain is that there exists no ‘orange head’ Geophagus species in the Araguaia or Xingú – it is in fact highly endemic and confined to the lower Tapajós. 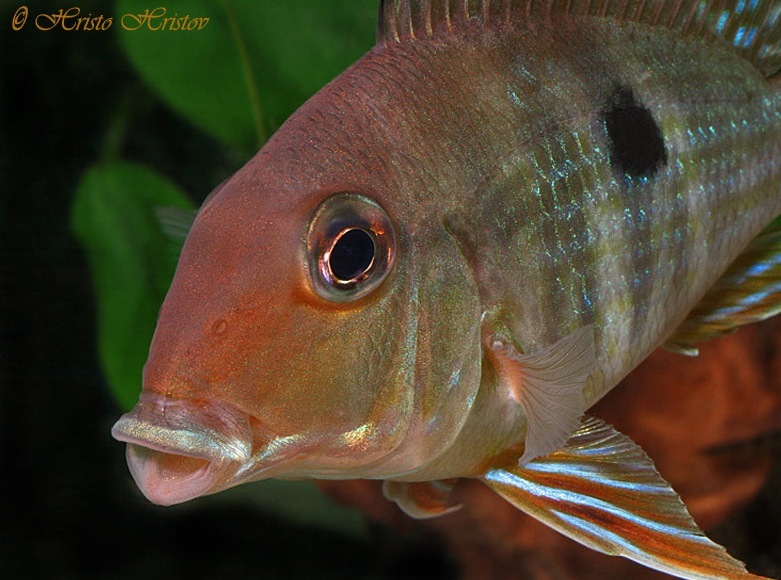 The ‘orange head Araguaia’ form mostly inhabits the main river channel while the more intensely-coloured variant occurs in the rio Arapiuns. The latter tributary empties into the Tapajós close to its mouth, on the opposite bank to the city of Santarém and a little downstream of the Alter Do Chão lagoon which is the primary collection point for the aquarium trade. The Arapiuns ia an acidic blackwater river characterised by low mineral content, pH and clear, tannin-stained water. The Tapajós main channel contains so-called ‘white’ water with a slightly acidic to neutral pH and low hardness but significant amounts of material in suspension at times giving it a cloudy appearance. In both cases favoured habitats are gently sloping marginal zones around shores or islands with soft substrates of bare sand or mud. Depending on locality other features can include scattered rocks, submerged tree roots, branches and leaf litter. At the confluence of the Tapajós and Arapiuns G. sp. ‘orange head’ was observed in clear water (visibility close to 20 m) which was flowing moderately over a substrate consisting of submerged boulders with long stretches of white sand between. 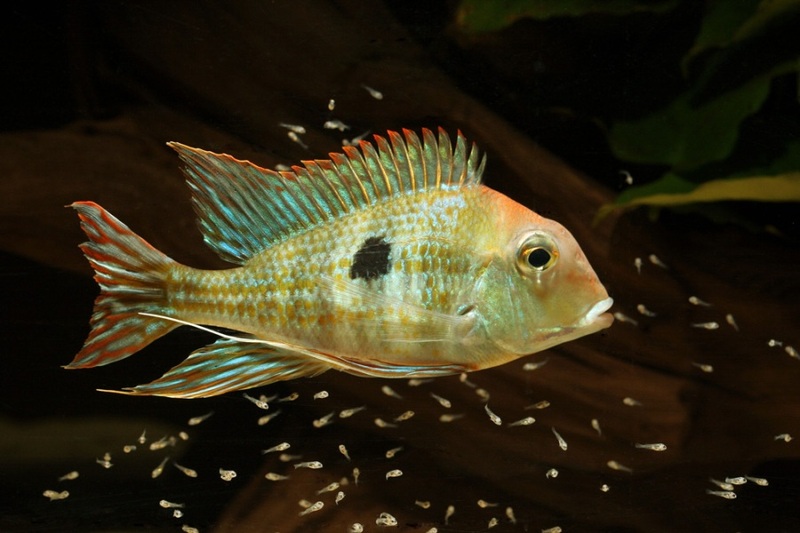 There was little in the way of vegetation or wood, pH was around neutral and adult specimens could be observed swimming in pairs with sexually inactive individuals congregating in groups of up to 20 (J. Cardwell, pers. comm.). 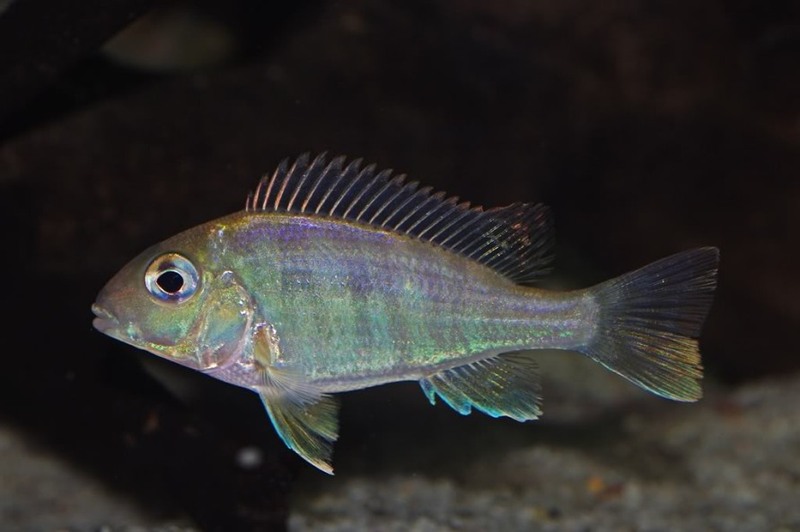 Other species known from the Tapajós and available in the hobby include Hyphessobrycon pulchripinnis, Nannostomus beckfordi, Metynnis argenteus, Pterophyllum scalare, Satanoperca jurupari, Heros efasciatus, Mesonauta festivus, Laetacara curviceps, Ancistrus dolichopterus, Hypancistrus sp. L260 and Peckoltia compta/L134 plus a number of occasionally traded ones such as Hyphessobrycon heliacus, H. vilmae, Dicrossus maculatus, Corydoras ornatus, Panaque sp. L027 (aka P. sp. cf. 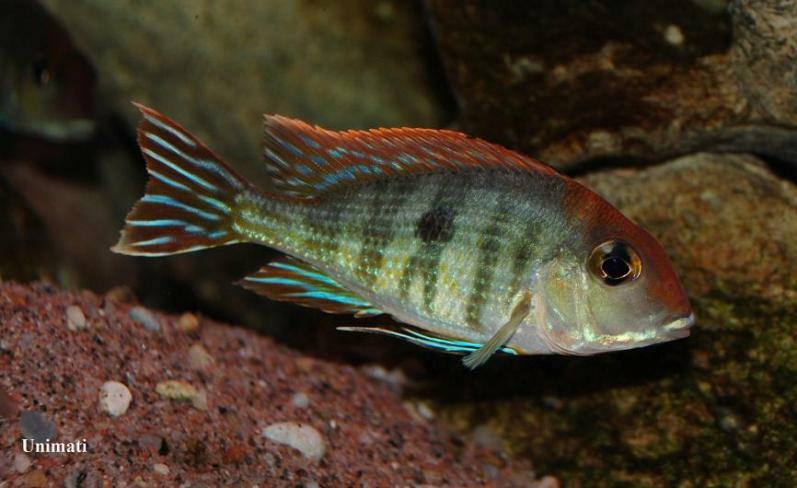 nigrolineatus `Tapajós’? ), Leporacanthicus joselimai/L264, Peckoltia snethlageae/L141/L215 and Pseudacanthicus sp. L273. 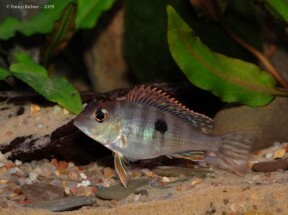 There’?s also another undescribed Geophagus species from the lower Tapajós which has a smaller dark marking on each flank, lacks the orange head colouration and has appeared in the trade as G. sp. ‘Tapajós II’. 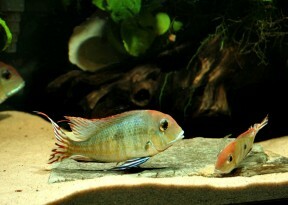 Some aquarists keep Geophagus spp. alongside freshwater stingrays of the genus Potamotrygon which in many cases has proven successful but in some has resulted in them disappearing at night. 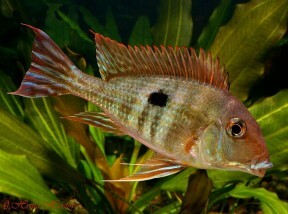 G. sp. 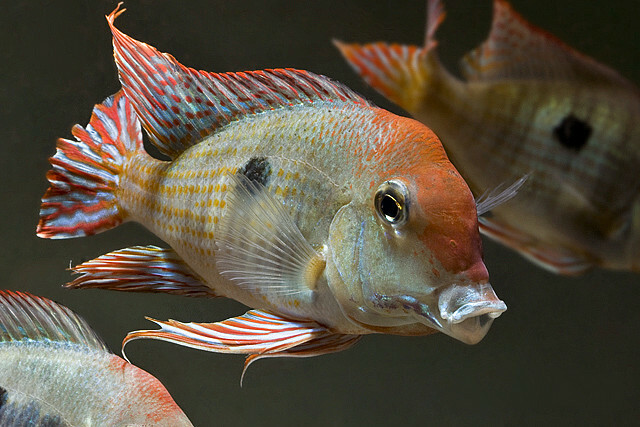 ‘orange head’ is gregarious and tends to exist in loose aggregations unless spawning, with juveniles in particular displaying strong grouping instincts. Males are more intensely-coloured than females, tend to be a little larger and develop longer fin extensions. Some dominant individuals develop a nuchal hump as they mature. This is normally a piece of décor such as a flat rock or section of driftwood although it’s not unknown for the base of the aquarium to be used. The chosen area is then cleaned and defended against intruders. Once the fry are free swimming brood care/defence is shared although this varies depending on the male with some individuals becoming involved earlier and others not at all. This undescribed species is also known as G. sp. 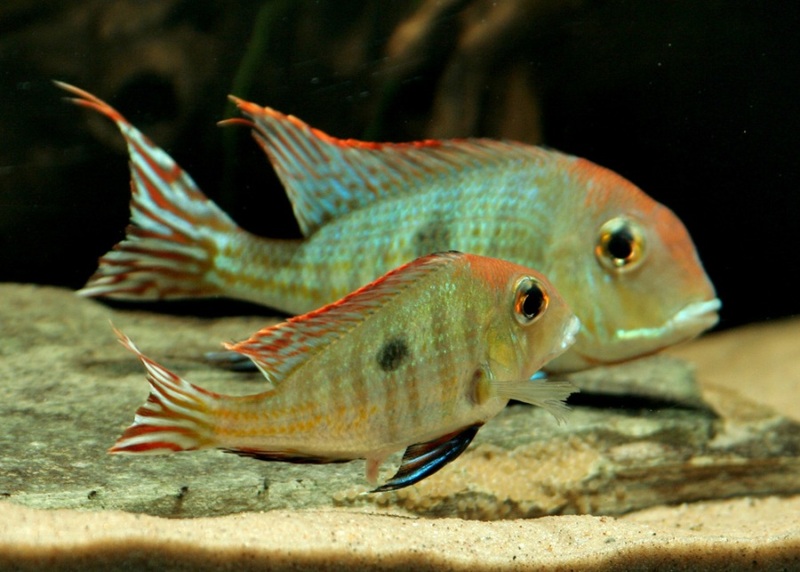 ‘red head Tapajós’ but when first exported for aquaria was referred to as G. sp. ‘orange head’ so that name is given priority here. 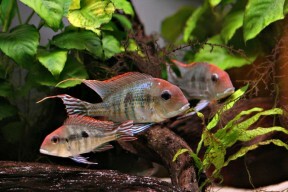 It’s achieved great popularity in the hobby and is now one of the more readily available members of the genus. Unfortunately this ‘fashionable’ status has led to quality issues with many commercial breeders producing the species with no regard to culling deformed fry, for example. If wild fish are unavailable buy from a reputable shop or hobbyist. 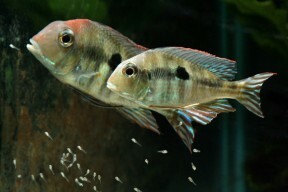 There are at least two variants available one of which is usually traded as G. sp. ‘Araguaia orange head’. This is misleading since both are endemic to the Tapajós drainage (see ‘Distribution’), and appears to date back to an error in collection locality when the fish were first exported. The two differ in the extent of orange colouration on the head which extends onto the opercle in G. sp. ‘orange head (rio Arapiuns form) but is mostly restricted to the area above the eyes in G. sp. ‘Araguaia orange head’ (Tapajós main channel form). 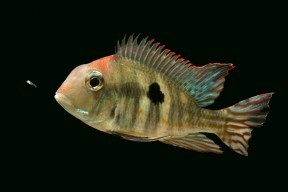 There is also a solid bar of orange pigmentation running along the dorsal surface between dorsal and caudal fin in the Arapiuns form which isn’t present in the Tapajós variant. 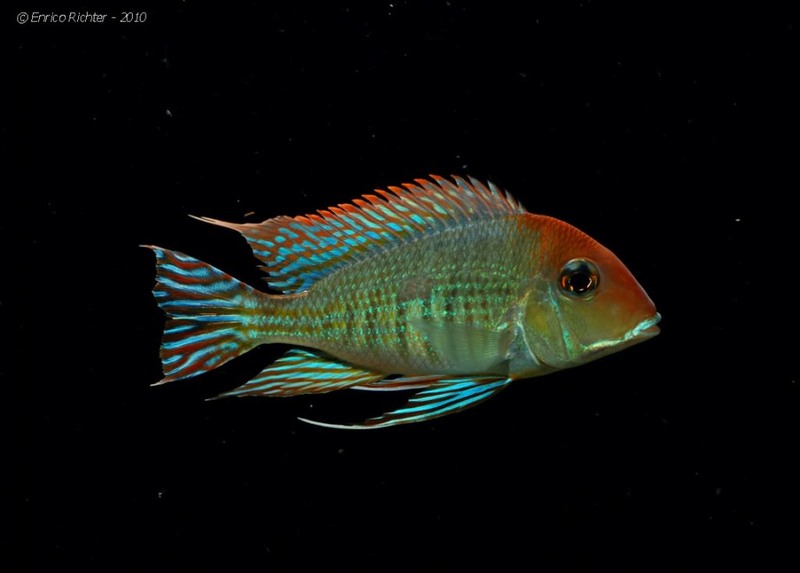 The intensity of both head and dorsal stripe appears to be directly related to age, gender and social position, with dominant adult males displaying the greatest extent, although in general the Arapiuns form is the more brightly-coloured. Despite these differences the two forms appear to represent a single species which should undoubtedly be included in the putative G. surinamensis ‘group’ within the genus. Since no other members possess the orange head colouration it’s also among the easiest to distinguish. Young specimens also have five dark, parallel, vertical bars on the body (normally visible only when the fish are stressed, spawning or preserved) of which the anterior four become bifurcate (vertically split) as the fish mature. 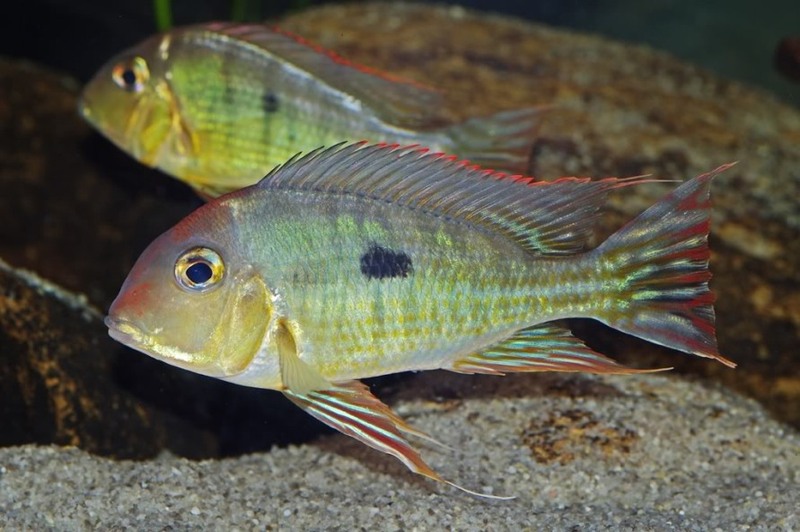 There are no dark preopercular markings and caudal-fin patterning consists of irregular, alternating reddish and bluish to whiteish horizontal bands. The number of species awaiting description is unconfirmed but it seems feasible that certain rivers within the Río Orinoco, rio Amazonas, rio Tocantins and rio Parnaíba basinsm, plus coastal drainages of the Guianas, contain one or two endemic forms. Geophagus gottwaldi sp. n. - a new species of cichlid fish (Teleostei: Perciformes: Cichlidae) from the drainage of the upper rí­o Orinoco in Venezuela. Geophagus sp. 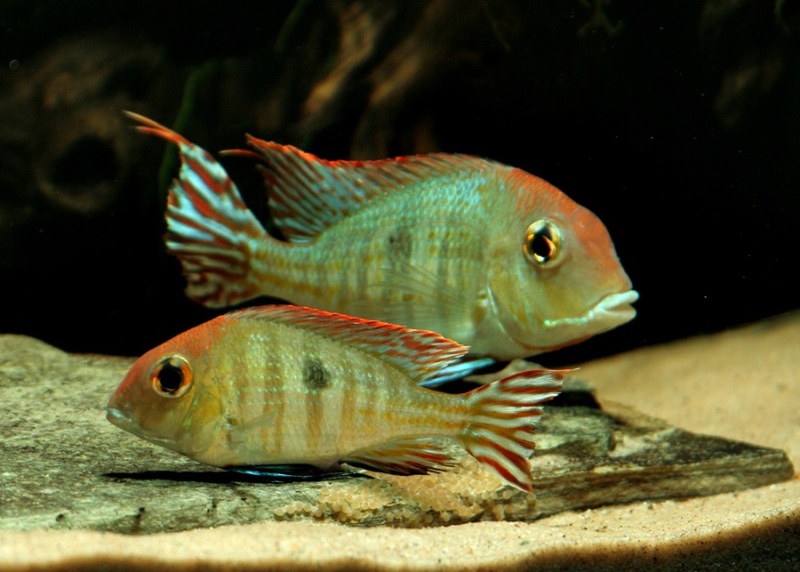 ‘tapajós red head’: The fish that changed my mind.